Here is where I sit. 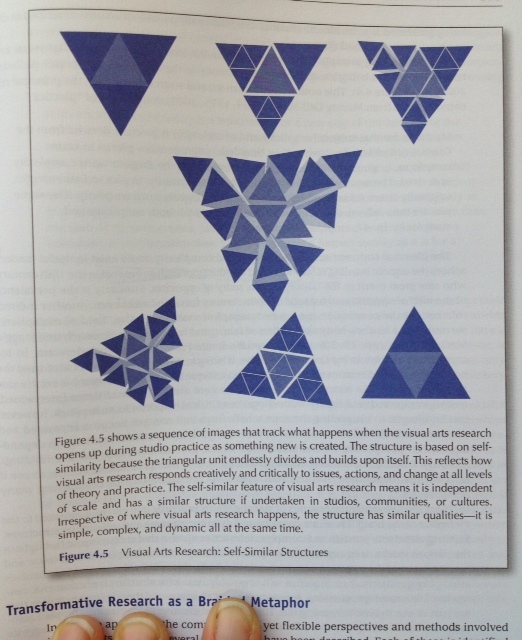 I am studying the Framework of Visual Arts Research. Related, this photo struck me when I came across it recently. My understanding of the image is in perfect serendipity with my current chapter topic, Self-Similar Research Structures. 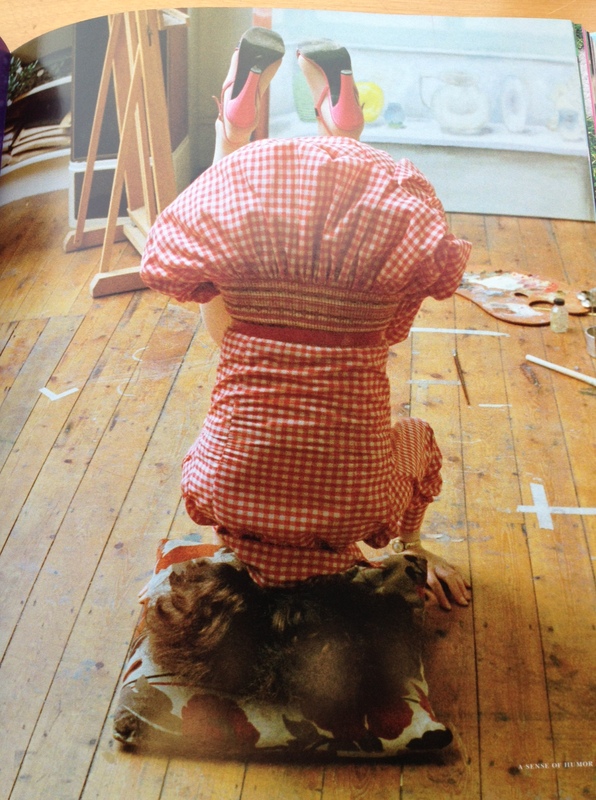 At first glance the woman in the photo is all upside-down, mixed up and heavy -then immediate second thought- she’s in her element in the studio and doing a yoga headstand (something that requires a great deal of personal strength and control), challenging herself to see the art in front of her in a new/fresh way. Which leads me back to the subject of Self-Similar Research Structures…. 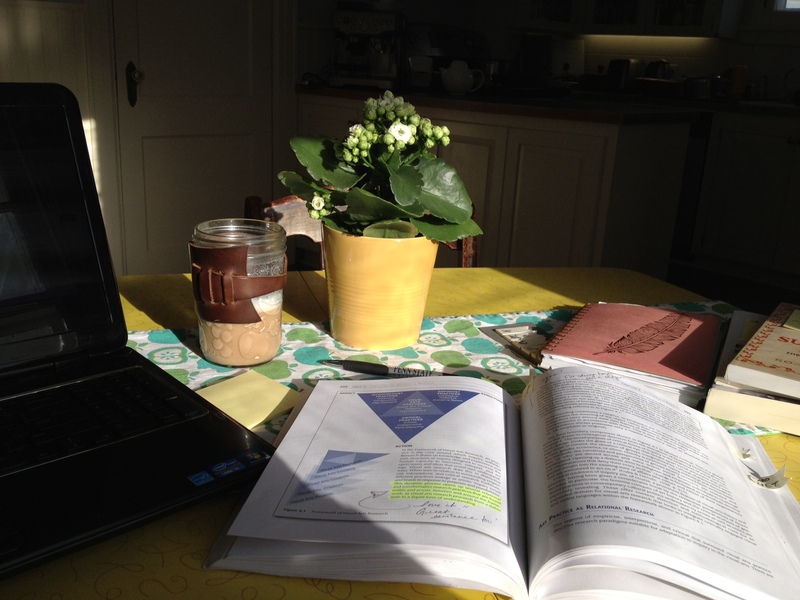 At this point in my research I am developing a framework for my practice-based research project. Daily, I reach deep into myself to maintain the courage to hold onto this slippery and permeable practice as I leap out into the exciting void trusting that one of two things will happen; either I will find something solid to stand on – or I will learn to fly. Anyone interested in human engagement in a changing social, cultural, and global world brought into sharper focus by the critical cuts of postmodernism and the pervasive possibilities of technologies cannot help but be excited. Amid this uncertainty and creativity there are dilemmas as past convictions come under challenge. For instance, the reductive paradigm that served art and science so well for so long no longer reveals the elusive truths thoughts to reside within matter and motion. Scientists and artists who are really interested in finding order within chaos and who see the mirocworld and macroworld around us as the lab or the studio are looking deep into material processes and organizing patterns with surprising outcomes. And these investigations often get carried out in the spaces between disciplines and without the safety net of codified practices. […] Therefore, art practice needs to be seen as a valuable site for raising theoretically profound questions and exploring them using robust research methods. Further, there is an extensive range of modalities and methods that can be used the yield critically grounded and individually transforming outcomes. 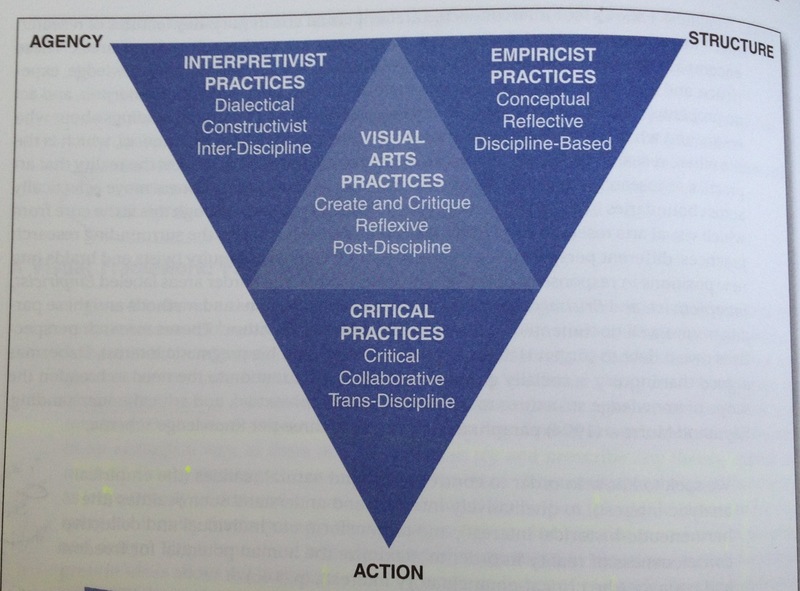 From this perspective, artistic practice can be seen to comprise a critical coalition of practices that involve an ongoing dialogue within and across , between and around the artist, artwork and context, where each has a role to play in the pursuit of understanding. But to argue that are practice is a form of research in the way ,there is a need to accept that the visual image is a source and site of knowledge and understanding. This is a plausible claim if we consider how images operate as texts, artifacts, and events that embody individual and cultural meanings. And within this layering of image structures, there are mediated processes and systems of production and exchange that further complicate and intensify the status of images as information sites and cultural codes. I self-identify as: A Maker. Contemporary Craft; Collaborative Pedagogy; Feminist Ethics; Community; Practice-Based Research; Doing (making) as a way of Knowing; Fibre Arts; Sculpture; Installation; Drawing; Painting.